Another show come and gone. My 40th I believe as my first was in 1971 and I have only missed two since. I have watched the “show” go through a fairly stagnant stage to one of full speed ahead to a time of forlorn faces and pessimism to this year’s cautious optimism. Though this year’s show was very nicely organized and looked good, I have to believe that the number of exhibitors and floor space rented has gone down substantially since the heady days. Unfortunately, it was our perception that the attendee numbers were down as well this year. We were very busy on Wednesday morning, relatively steady in the afternoon, slightly less on Thursday am and really dead on Thursday afternoon. The last hours of any and all shows are pretty slow so not unexpected. However, last year it seemed we were a good bit busier throughout. Wednesday AM before the distributor preview. 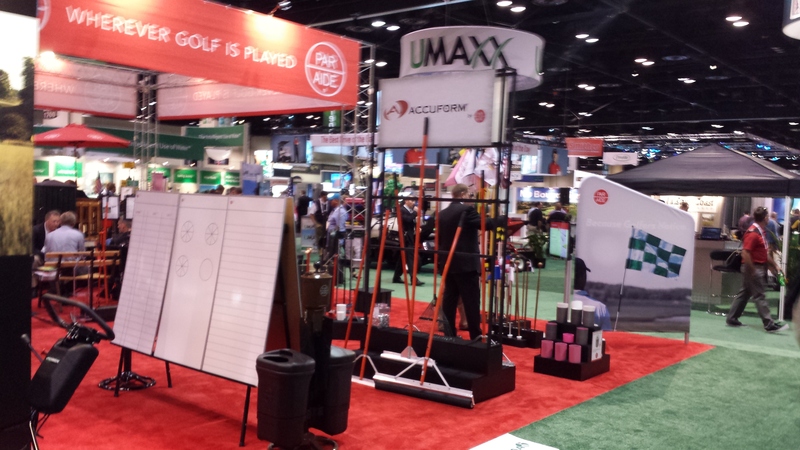 Sometimes we question the value of the show and the substantial cost, especially for the number of end-user customers (Superintendents) that “touch” our booth and/or personnel. However, we also consider the national show to be our international distributor meeting as we see a majority of those folks who bring our products to the marketplace, in the US and throughout the world. I am not so sure most have any idea what goes into putting up a booth, so thought I would share our efforts. Three days ahead of the show (this year Sunday) three of our people will fly in to begin the process of taking the product and displays out of 8 crates and 2 pallets. Monday am two more will fly in as the set up continues and the rest of us on Tuesday to help with final arrangement of products and preparation for our visitors. We bring Tom and Gary who run our manufacturing operation for their production and materials expertise, Dawn as she is in communication with so many of our dealers on a regular basis, Dan and Scott who head up our sales and marketing and know many if not all of our dealers personally, Mike who primarily handles international affairs, and finally, me – I hand out the mints. Looking down the main aisle at about 7am on Wednesday. The trade show hours average 10 hours a day and none of us are out of the booth for personal time except for a short lunch (usually a hot dog) and bathroom visits. It makes for a long time on one’s feet and our backs will further attest to it. At the end of the second day, tear down begins with what we call the Velcro symphony, so named from the cacophony of pop up booths being stripped of their panels. It takes us (all 7 of us) roughly 5 hours from start of tear down to shipping labels on crates. This year we got our crates in relatively short order and thus not having to wait for them got us to a beer and pizza about an hour earlier than normal. Once back home the work begins. Following up on inquiries, product information, requests, as well as delving into product ideas presented and improvements suggested. It’s truly exhausting but there is a sense of excitement to it all as well. Till next year in Orlando. For over 10 years I have worked with and for Independent Distributors in the professional T&O business and most all of them derive a good part of their revenues from selling to the Golf Course Industry, which means dealing with Superintendents and their staff. This is not an easy task, particularly at a time that golf revenues have been contracting, many golf courses find themselves overextended, budgets have been slashed and there is a pervasive concern about “the other shoe dropping”. On the distribution side similar stresses have surfaced. The downturn in the economy and the commoditization of the business has made top line revenues harder to come by and margins drop precipitously. Under those conditions relationships get easily strained and calm and consistent planning and decision making becomes more the exception than the rule. Yet, the parties involved, the golf course superintendent and the distributor, better understand that they are part of the same supply chain that depends for success and profitability on how well the end-user customer –i.e. the golfer – gets serviced. They should be working hand‐in‐glove on giving the golfing public good reasons to keep coming back. Distribution of golf course maintenance products and services is a B to B business that thrives on personal contact between the distributor (representative) and the superintendent. The quality and sincerity of that relationship is key to achieving a smooth, uninterrupted and cost effective supply of the products required for proper and timely course maintenance. A supply chain becomes dysfunctional when the links in the chain work at cross‐purposes or become adversarial in their attitude. The 7 things distributors wish that superintendents would understand and always keep in mind come in large part down to variations upon the “Golden Rule”: “Do unto others as you would have them do unto you”. We truly appreciate your business. We try very hard to re‐earn it every year and we never take it for granted. You want to have your golf course at all times weed‐free, insect‐free, disease‐free, wear tolerant and aesthetically pleasing. Leave it to me to provide you the “solutions” for these challenges, so that I can brand my business, keep you on budget and keep my company profitable. Where are your supplies coming from when you need them after you have squeezed me and all the other independents out of business by putting everything up for bid without regard to the ultimate supplier’s capacity to service the business, deliver on time and with the right equipment and be there for emergency needs and technical support? Just like in the restaurant business where there is a growing awareness that working with local food sources makes good sense for all living in a community, including the customer, so does access to a distributor in your own backyard, who is part of the same community you belong to, provide a solid base for great service and a reliable and sustainable supply relationship. 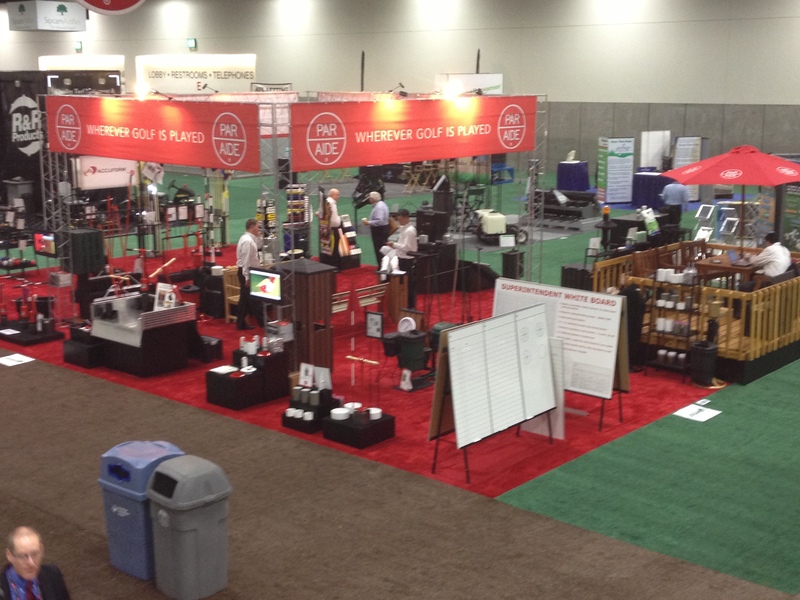 With the patent expiration of almost all plant protection products and the resulting commoditization of the business, margins have been squeezed out of each transaction level in the supply chain process and perks like golfing trips, logo wear, catalogs full of luxury items to be redeemed for “points” and sponsorships of all kinds have been replaced by the “everyday low price”. You can’t have it both ways! You and your spouse may feel that you are missing out on a good thing, but isn’t the current way of doing business fairer to the people who write your pay‐check and better for the end‐user customer, the golfer? Treat me like you want to be treated. Don’t mislead me about what you truly want and need and don’t mislead me about my chances to earn your business. Not showing up for an appointment is unprofessional and a waste of my time. If you use me for information and technical support, but buy from someone else, you will quickly lose my interest in being there for you when you really need me. You surely realize that there is an opportunity cost to visiting with you if it does not result in business at some point. In times of high pressure my first allegiance goes to the course that patronizes my business all through the year. With a little advance planning all needs can be met in time. If you leave me in the dark about what you need when, chances are that you will have to wait a few days before I can get you what you need. I’ll be glad to work from dawn to dusk for you as long as you keep me in the loop about your anticipated needs. If my bills do not get paid on time, my capacity to service you is jeopardized. Be candid with me even if the news you have to share is not what you would like to communicate. If you are forced to do more with less, I will understand that. It happens to me too. In an open communication we can surely find a way to keep your course in good shape without breaking the bank. Believe me; I’m on your side. I don’t want to see you lose your job! That would force me to start all over again building a relationship with a greenhorn who might be gun‐shy because of what happened to you. © 2012 Castnet Corp. All rights reserved. Just returned from 2012 GIS in Las Vegas. I have little idea what the weather was nor did I, who likes to gamble, place one bet. Now that the show is two days long or should I say two long days, there is little time spent outside the concrete walls of the convention center. This was my 39th show, having missed only two since Denver in 1971. We’ve gone through a lot of mints in that time! I have watched both our booth and the show grow considerably during that time and while the show has shrunk, our booth has not. This really does cause us to pause and consider costs vs. benefit. 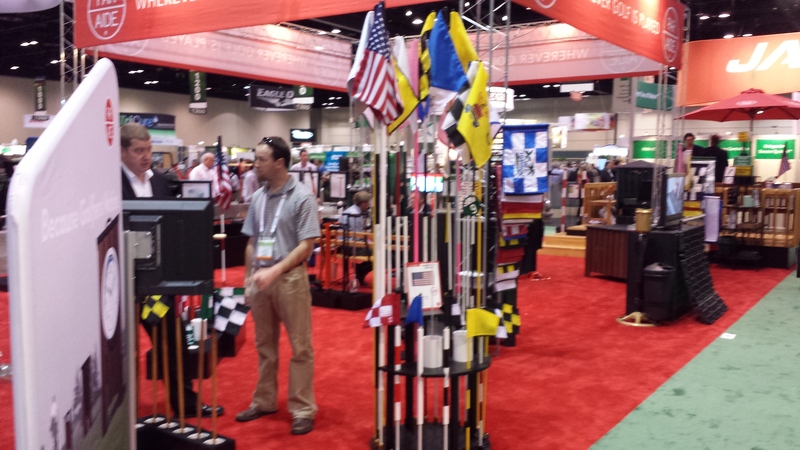 However, our line has expanded and the Superintendents and Dealers deserve our best foot forward. We were conflicted amongst our personnel this year as to the traffic and interest. To me, it seemed the numbers were a bit down though in fairness, I am required to give my whole attention to our Dealer network. I do know that in the past, the Par Aide booth was the general meeting place for the MN Superintendents in attendance and that number was down significantly and quite frankly has been for a number of years. In general the show looked great and I think most enjoy the venue though it can be argued that it probably appeals more to those who make it a guy’s or couple’s trip than those who use it as a family business/vacation. Two things can be said about Las Vegas. One, it looks very different since our last stop there and two; the town has really fallen on hard times. There are some fabulous new properties to see and visit and a number of projects that have been halted in construction, some nearly complete. 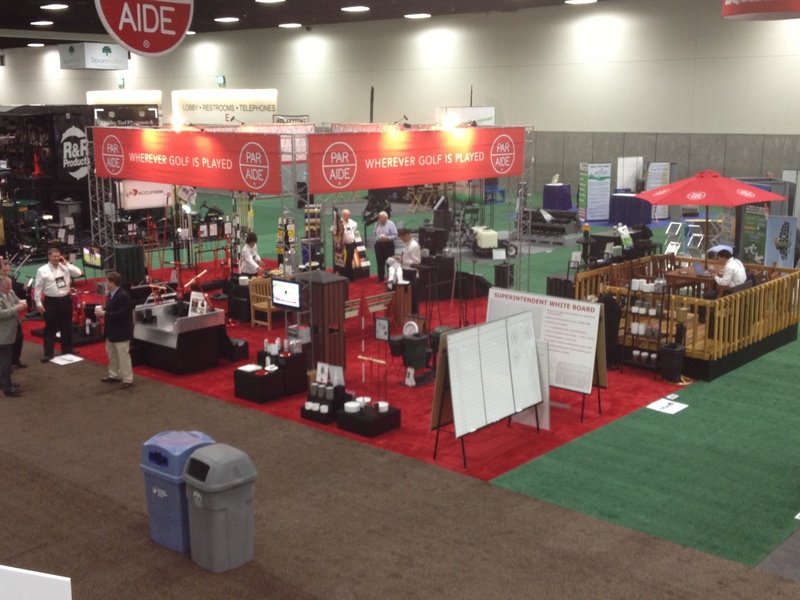 The trade show did not seem to have any buzz this year which is usually created by a new and exciting product. However, don’t take my word for it as I usually am the last to know. 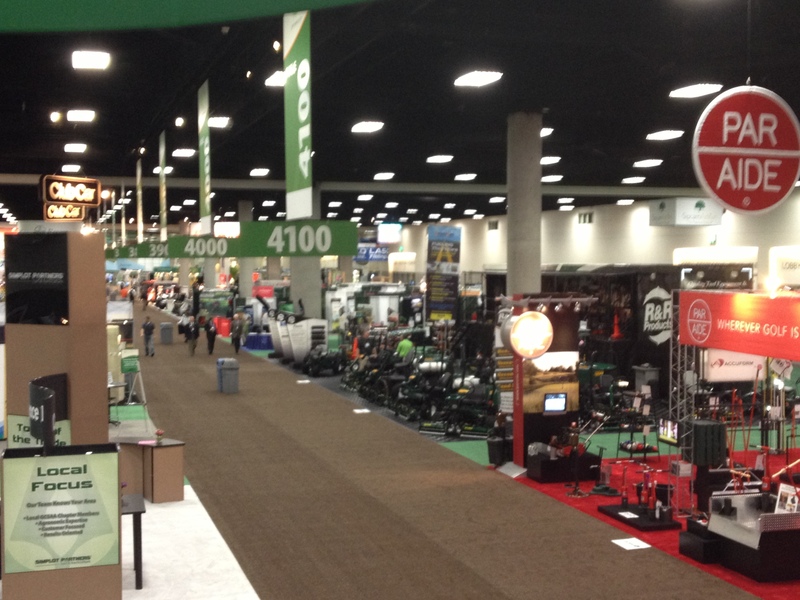 Next year it’s San Diego, with the trade show Feb 6-7. The following year is Orlando and in 2015, San Antonio. Hope to see you there. Any follower of NASCAR will recognize Silly Season as that time of the year when the circuit is over and either by their choice or not, a few drivers will move from one team to another. Unfortunately, this happens in the Golf Course Superintendents’ world as well. Unfortunately, it is usually not the Supt’s choice. This year was no different in our area. The weather was unusual at best and created conditions under which turf grass suffered. As a result at least a couple of guys were relieved of their position. Now I need to be clear that I am certainly no judge of the skills of any particular Superintendent as I don’t pretend to know much if anything about growing grass. And, of course, I am not privy to the conversations and facts that led to any one person’s dismissal. However, I can speak to the individual’s character, dedication, and work ethic as I have seen it. And, once again this year, I am baffled at decisions that were made. Budgets are tight, no question, but really in the scope of a golf course operation is a reduction in payroll by replacing an experienced person with a lower paid person, truly material? I just cannot imagine that there are ultimately savings after the change over but maybe it works. I can tell you in our business, it would take quite a while for a new person to get up to speed with a lost seasoned veteran, and what costs are associated with mistakes and inefficiencies during the learning process? Over my many years of watching “silly season” moves, I hope that I might be of encouragement to those of you who are currently “between jobs” and those who might find themselves in that situation in a future “season”. I believe that, without exception, all of the people who I have been close enough to, to have had information, are all doing quite well. Some ended up in better positions within their chosen field while others moved to a different side of golf, and others yet left the golf business altogether. It’s hard to offer optimism when it is clear your world is fine and the one you are trying to encourage is very down. Things will work out. Make use of all of your contacts. Don’t fail to do this out of embarrassment. Job changes are now a fact of life. There is little to any loyalty left, at any level. Keep your mind open to any and all opportunities or ideas. You will be just fine if my experience is any judge. 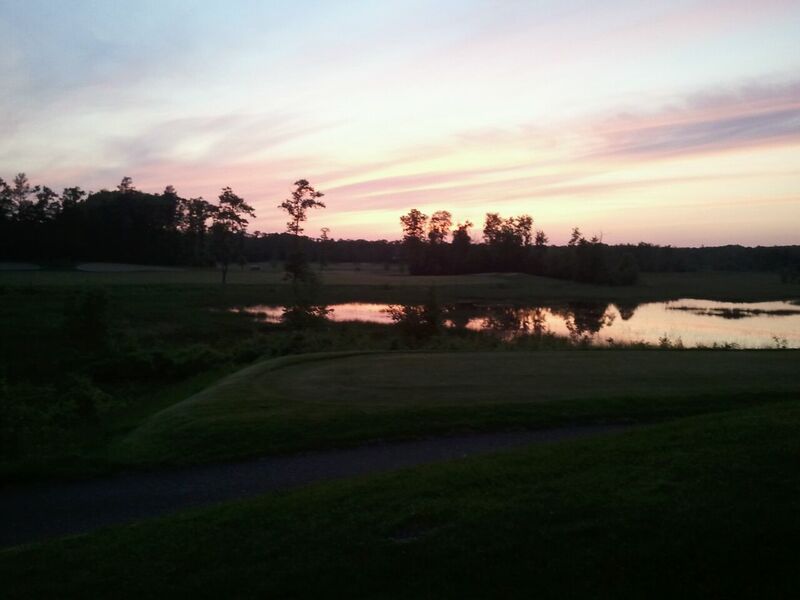 Scott, from our Sales & Marketing department, is guest blogging about a recent golf trip he organized to Cragun’s Resort in Brainerd, MN. I recently went on a golf trip to Cragun’s Resort in northern MN. It was a large group of 28 golfers. We have been making trips like this since 2002, the locations change from year to year. We revisit locations we like, mainly for the golf courses or locations. However this year we tried somewhere we had never gone before. The golf courses were in fantastic shape and the location was perfect, but the main reason we will be going back was the service we received. We arrived Friday morning for 36 holes of golf with the 1st tee time starting at 9am. Upon arriving at the resorts courses we were greeted by the folks working the bag drop. We told them who we were and what group we were with and they set us up in our carts. I went into the pro shop to let them know our group had arrived. They simply said “enjoy the day, everything is taken care of”. I asked if anybody needed to come and see them and they said, “No sir, your group is all set to go”. After golf, tables were reserved for our large group and we were served promptly by a team of servers. Saturday morning came and with it breakfast in the main lodge. We were greeted and shown to the table that was set aside for our group. The courteous staff was quick to check on us and make us feel at home. At the course we realized 30 minutes before teeing off that we forgot to mention that we wanted proximity markers on the par 3’s. After notifying the pro shop we were told, “We’ll have everything taken care of before your 1st group goes off.” Off we went to repeat play another 36 holes like the day before. The 17th Hole at Cragun's Bobby's Legacy Golf Course. Another great dinner after golf as well as breakfast the next morning, which lead to a lot of comments from the rest of the group. They routinely said that on the golf course, at dinner or breakfast how great the service was. They had never heard so many “thank you’s”, “You’re welcome’s”, “I’ll get that for you”, “have a great day” and “how was the round”. It’s great to see a golf resort dependent on large groups (we spent over $11,000 on lodging and golf alone) to make a large majority of their money, create such a great impression with their service on a group of golfers. In the golf industry where competition for each golfer gets more and more fierce, this obviously can set you apart. So that no one thinks I am dissin’ them, I am not a member of any of the networking internet sites. I hope to never have to sign up with Plaxo or Linkedin or any other. This is partly because I don’t understand why I would want to be signed up. Friends are always welcome to text, email or call me. And, I sort of look at it the same way. If you are my friend, I know how to reach you or at least can find a way. I also don’t have a Facebook page nor do I understand Twitter or why I would want to know what someone was doing every second of the day. Unfortunately, I suppose these two will eventually take over communication if it isn’t an even more advanced method. I have suggested for years that we eventually will have an earpiece and microphone implanted in our bodies so we don’t even have to hold a phone. However, I am not blind to the ever-changing landscape of personal and business communication. As such, our marketing team has informed me that Par Aide we have joined the ranks of the Facebook universe! So, we now have a blog, a Facebook page and a YouTube channel…I guess Twitter is next, but the jury is still out on how it could work for Par Aide!! There is no doubt that Social Media is the hot trend right now in the business world, in fact, 80% of Fortune 100 businesses are using some sort of Social Media, so I guess we are in good company!! Just give me a voice controlled television. Now that would be a valuable innovation!